THE SISTERS ADORERS OF THE BLOOD OF CHRIST came to Budžak, a part of Banja Luka, in 1879, seven years after the Sisters of Charity. They founded the convent of «Nazaret», where they established a school and an orphanage and later a girls’ school in the center of Banja Luka (on the location of today’s “Chamber of the RS Military”). Many generations of Banja Luka girls have been educated there. The sisters also had a community in great proximity of that school, called «Marija Pomoćnica» and one in the Bishop’s ordinariate. Today, they only work in the ordinariate and reside in the convent of «Novi Nazaret» in Banja Luka. After World War II, the sisters were expelled from Bosnia and Herzegovina, their property was confiscated and the beautiful convent church torn down in 1950! Today, there are military barracks on that location. The Roman Catholic Church in Bosnia and Herzegovina is part of the worldwide Roman Catholic Church, under the spiritual leadership of the Pope and curia in Rome. Archbishop Alessandro D'Errico is the Apostolic Nuncio to Bosnia and Herzegovina and to Montenegro. Christianity was introduced into Bosnia and Herzegovina from Salona at a very early date. Many of the dioceses which were suffragans of the Archdiocese of Salona in the 6th century must be sought within the present limits of Bosnia and Herzegovina. This is especially true of the Bishopric of Bistue (Bestoeensis ecclesia) which was situated in the heart of the upper part of the present Bosnia. The youngest parish in Banja Luka is only 20 years old. 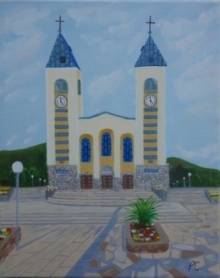 It’s Budžak parish, established in October 13, 1983 and settled in Derviši. Only the parish house was built, and the building of the parish church was interrupted by the recent war. There is a convent for the Sisters of the Christ Precious Blood, and their chapel served for a long time as the parish liturgical space. There is a modest chapel dedicated to Our lady of Lourdes, and there is no cemetery. The number of believers in Banja Luka and the surrounding region has changed considerably during past and more recent history. This was due to the population decline of catastrophic proportions, especially after Second World War and during the Croatian War for Independence (Homeland War) from 1992 till 1995, which was ended in tragedy and the almost total exile or exodus of the Catholic population of this region. From some parishes only fragments of the original congregation remained, mainly the elderly. Thus, in spite of a small number of returning citizens, the population still declines gradually and is threatened with extinctin. All that was mentioned above relates to the Roman Catholics, that is Catholics of the Western (Roman) rite. However, in Banja Luka there are also Catholics of the Eastern (Greek Catholic) rite, mainly of Ukrainian background, who have their own parish. Their liturgical center is located in the very heart of the town, right next to the convent of the Sisters of Charity (in today's “Serbian street”).